Wow, what a journey I am on. By 2010, I weighed 407 pounds, was on ten different prescribed medications and headed towards an early death from morbid obesity. On September 22nd, of 2010, my system went into complete renal failure, I had not slept for 13 days and was rushed to the hospital. I remember it well, as it ruined my wife, Tere’s birthday. Early in 2011, my wife Tere, was diagnosed with breast cancer and our lives were changed forever. I had a epiphany in realizing that I was ignoring the most important people in my life, my wife, my sister in New York, and other family and friends that stuck with me through it all. I was now determined to start the journey to heal myself so I could be at my best for my wife, my love, my best friend, my hero. I AM LIFE! I AM STRENGTH! From that date forward, instead of just waiting for an early death from morbid obesity, I vowed to do something. I watched my favorite uncle suffer from the effects of obesity and slowly die a horrible death and did not want suffer the same fate. I tried to lose weight with every type of diet plan out there, even considering the lap band procedure. I started walking a mile or two a day and researching different programs, but they all involved drugs or surgery. Then I met a great western doctor, Dr. Raymond Lorenzato, who was not an advocate for the drug companies. He introduced me to the grain-free way of life. Shortly after that I found Brien through a testimonial on the internet. From our first exchange of emails, I knew I had discovered the right person to help me. Brien and I met for the first time on October 3rd of 2011. Brien explained to me that many of the things I was doing to try to lose weight were only adding to the problem. His first suggestion was to make every meal I was going to eat in the next 30 days from scratch. On October 10th 2011, I started the 21 day Detox. During the 21 days I lost 21 pounds. I AM CHANGE! The following week I started attending the Saturday boot camp in Menlo Park with Brien. I remember the first boot camp very well, not being able to move and needing help getting up from the floor after we did the warm up. Everyone was very helpful, but I am sure they thought I would never return. During the next few months I started attending boot camp 3 days a week… again, not being able to get up off the floor and having two or three people help me to my feet. By Christmas I had lost 40 lbs. I was able to move a little bit more but still weighed over 360 lbs. I AM COURAGE! The next step was the most effective. Brien explained nutrition was the key. Sugars, processed foods, grains and the “low-fat” syndrome is what causes obesity. I cleared the house of all processed foods and sugar. Tere and I started making every meal from scratch. I believe this way of life also help Tere through her battle with cancer. I continued to lose weight and gain strength. I started with Brien’s walking and running group on Saturdays from its inception. The first time I went I could barely make it a quarter mile. I continued to go every Saturday and increase my distance. Finally, I was able to run very slowly for a short distance. I continued to gain distance and speed. I AM DETERMINED! The boot camps are fun, everyone is supportive and encouraging, the coaches are very knowledgeable and helpful and the workout never becomes too easy because you just work harder at it. Brien has a whole team of professionals who can help every aspect and root cause of current weight problems. Shannon Doyle is a fantastic hypnotherapist who helped me through the underlying causes of my weight gain and inability to lose it. She made me realize it is okay to remove toxic people from your life. I think it is God’s way of protecting me from further harm. Early in 2014 I signed up to do the AT&T Spartan Race. In the following months I increased the intensity of my work outs and eliminated all dairy from my food plan. I took an obstacle racing class from Mike King, one of the elite OCR participants at Shamp’s boot camps which provided some of the tricks of the trade. I became increasing nervous in the months and weeks leading up to the race. Finally it was race day, I was so excited. I arrived 3 hours early to the park. I had been training hard and intensified my work outs. The atmosphere was buzzing and the race was ready to start. Prior to entering the gate there was a six foot wall to go over and I did it with no hesitation. Once the race started the were several nets and ropes to go under, then some small obstacles. The first large obstacle was an 8 foot wall. I approached the wall, threw my legs over, and catapulted over landing on uneven pavement and severely spraining my ankle. I was determined to complete the race even with a sprained ankle. I was attended to by medical personnel and then headed back into the race. It took me over two hours, but I completed the race. I AM SPARTAN! I AM BADASS! As of the date of this essay, I have lost over 150 lbs, much more than that if you count all the ups and downs, but more importantly I AM HEALTHY, I AM PRIORITY!! I have been off all prescribed medication for almost two years now. My blood sugar dropped and holds steady at 85-95. My blood pressure is 120/78. I have completed a Spartan Race and several 10k trail runs. I run 5 miles every Saturday and attend boot camp three days a week, including Saturday morning after my run. I sleep at least eight hours a night, and fall asleep when my head hits the pillow. Oh, by the way I have a whole new bootcamp family and a new job with Stanford Health Care. 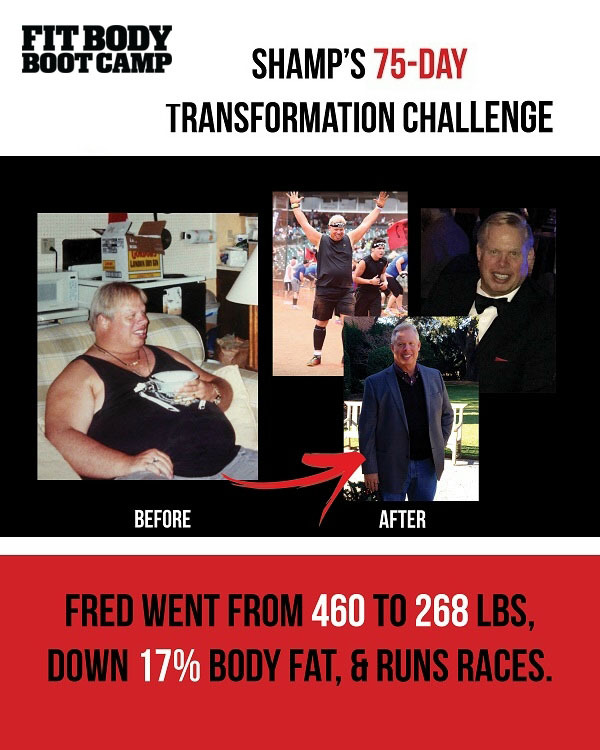 My goal with this challenge was not merely weight loss, toning and body fat reduction. My ultimate goal is spreading Brien’s health education and encouraging others with a supportive and positive attitude. I AM FAITH! I AM PASSION! Brien not only helps with your weight loss but is truly a life coach and a friend. Brien and the team of professionals he has at the studio, saved my life and changed my life. I thank my wife, who is my best friend, my love, and my hero for encouraging me and now I can be at my best for her. I AM LOVE. I am now in control of my mind, body and spirit! I AM PRIORITY!! If you can find a path with no obstacles, it probably doesn’t lead anywhere.